See my related articles here and here. The 1st day of February (the 12th/13th by the old Julian Calendar) in Ireland is marked by two coincident ancient religious festivals – the Gaelic Celtic feast of Imbolc and the feast day if St Brigit (Bride) of Kildare. It signifies the days when new life starts to become visible in the winter world – the appearance of the first flowers of the new year, the first buds on trees, and the mating and nesting of birds, and the birth of the first lambs of the year. To the ancient Greeks, this ‘event’ of nature – new life starting push through from the dead soil – was given special significance in the very ancient myth of the maiden (Kore) Persephone who, after being abducted by the god of the dead, Hades, was allowed to make an annual return to stay with her mother – the fertile earth, personified as Demeter (literally meaning ‘mother goddess’). This myth had a central part in the ancient Greek mystery religions, most notably that at Eleusis, near Athens in Attica. It was one of the most fundamental myths of ancient Greek religion, with origins traceable into the Bronze Age. As a mythic drama celebrating a returning junior fertility goddess, we have few clues that the old Celtic festival of Imbolc (first attested in writing in the 10thC Irish text known as ‘Cormac’s Glossary’) was a goddess festival – there are no references in medieval Irish manuscripts linking a festival named Imbolc to a ‘Persephone’ themed myth. However, the early Irish Christian church created a festival of their own on this day which was an explicit celebration of a maiden – that of Brigdhe (Bride) or Brigit of Kildare, whose early hagiographic tale begins with her adoption into a christian household as a child where she immediately causes an increase in the family’s food supplies through a number of miracles. This tale echoes the practical medieval (probably much older) practice of re-hiring servants on the first quarter day of the new solar year, when farm work begins again, it having been suspended at Samhain or St Martin’s day by ancient Atlantic European tradition. The period between Samhain and Imbolc was a time of relative ease in the pre-modern empirically-minded subsistence world: harvests had been gathered and stored, animals slaughtered and their meat cured and preserved. There was little need of servants or slaves to manage the heavier manual work and they were alleviated of their duties until the restarting of the Atlantic agricultural cycle, which undertook its first ploughing of fields from the start of the Imbolc quarter. This theme is echoed in the ancient Roman festival of Saturnalia (where slaves feasted with freemen) and at the Greek Summer Kronia (when it was too hot to work) and Winter Dionysia which was held around the same period as the Saturnalia. Nature was the book which gave the instructions! Of course, we have little evidence that Greek religion directly influenced northern Europe’s Celtic peoples, although every reason to suspect from the galvanising cultural and military explosion of the ‘Belgic’ movement of the Celts into the Balkans and Greek territories from the 4thC BCE that they expressed some notable sympathy with certain Greek myths, and the iconography of the Eleusinian myths (pine trees and ears of corn) appears upon the coins of British kings of the Augustan period. Caesar Augustus was an Eleusinian initiate who fostered many British Celtic nobles at his court in order to acculturate them ahead of further Roman plans at expansion. The Irish did not apparently mint coins, or play much part in the Roman scheme of conquest, except during its christian phase when they rose meteorically in prominence. It appears then, that the ancient legends Irish monks enthusiastically wrote down may have shared a common root with those of the Greeks, lost in the mists of the late stone ages and their mysterious megalithic religious cultures. It was a simple step for christians to appropriate her as their most important female saint and ‘holy virgin’ who passed her apprenticeship as a cowherd, dairy maid and household servant. Because of her triple-form she was therefore characterised hailed in the hagiographies as one of the ‘Three Maries of Ireland’. In the continental medieval biblical narrative, the ‘Three Maries’ of the Bible (the ones at the tomb of Jesus) appeared to have subsumed another pagan triplicity – a common theme in the middle ages. Legends attached to Saintes-Maries-de-la-Mer in Provence in the south of France claim these three Maries (Mary Magdalene, Mary mother of James and Mary Salome) landed by boat there. Southern Gaul was, of course, a Celtic province with strong early links to Greek and Roman culture. It was also important in the development and spread of christianity among the Celtic peoples. In order to draw a clearer comparison between Bride and Persephone, we need to look at Persephone’s mother: Demeter. Is there evidence of an Irish equivalent? Demeter represented the fruitful and fertile earth, and her child was therefore an example of her own self-begetting nature, and their legend an expression of the eternal (maternal) tragedy and joy of death an rebirth. As such, she an Persephone are two phases of the same idea, and it is to this concept we must link with the the triune nature by which the Celts conceived their gods. In fact, Demeter and Persephone were actually part of a mythological triplicity, completed by a third feminine goddess, Hekate, who was the sage ‘aid-woman’ who assisted Demeter in her search for her daughter. In later Greco-Roman art, she was depicted as ‘Hecate Triformis’ after the style of the Celtic divinities. Scholars have identified the cult of Demeter-Persephone-Hekate (the Eleusinian triad) and Artemis (sister of Apollo the Healer) with religious traditions extending back to the older ‘Potnia Theron’ goddess-character depicted so frequently in the art of the Minoan and Mycenaean ages. How could this ancient Greek triplicity be considered coterminous with the Irish Iron Age triple-goddess Brigit, as described in Cormac’s Glossary? On the surface, Cormac’s triadic goddess expresses a function of knowledge and wisdom, healing and creative dexterity – a set of values more appropriate to Athena, Artemis and the Muses, and possibly to Aphrodite as wife of Hephaistos. 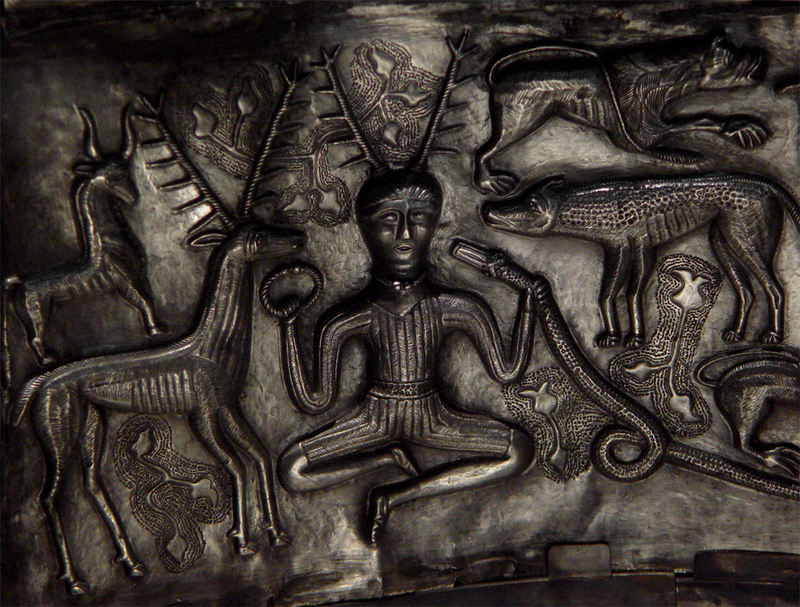 To make such a connection, we must understand how the ancient Gaels viewed the ‘blacksmith’ or ‘artifex’ archetype: This was essentially as the active process involved in reforging the world of nature – the ‘hidden craftsperson’ behind the ‘seasonal drama’. Such a character exists in a profusion of forms in Ireland’s post-Christian mythology: As the smith known variously as Chullain/Cuillin/Gullion (an important character of the Ulster Cycle), as the Gobán Saor (an archetypal ancient smith and builder credited with raising many ancient structures, sometimes enjoying a legendary plasticity with the Cailleach Bheara), the high-literary ‘god-character’ Goibniu (smith of the Tuatha De Danann) and the euhemerised saints Gobban of Leighlin, Gobnait and the related St Latiaran of Cullin. Even though most of these smith-archetypes of Irish Christian-era myth are male, the female is ever in attendance with them. In the case of St Laitiaran of Cullen’s sister saint, Gobnait, there is an explicit link with Brigit – her feast day falls on the 11th of February (Matyrology of Oengus), within a Julian calendar’s throw of the feast of Imbolc. Laitiaran and Gobnait were legendarily associated with a third sister-saint, again completing the ‘Brigitine’ triadic form. In the famous medieval ‘Mythological Cycle’ tales of Ireland’s god-like ancestors, the male triad Goibniu, Creidhne and Luchta (the Trí Dé Dána – Three Gods of Craft) are said in the tale Immacallam in dá Thúarad to be sons of Brigit of the Tuatha Dé Danann, and she the daughter of An Dagda. In the tale Tochmarch Etaine the Trí Dé Dána are said to have instead been Dagda, Lugh and Ogma, suggesting these were possibly of an older order, before the Age of metals. Goibniu was a master of blacksmithing, Creidhne a master of jewel-making and Luchta a craftsman in wood or builder (I.e. – a user of metal tools). Slieve Gullion in County Armagh evokes the name of the smith-king of the Ulster Cycle tales from whom the hero Cuchullain is named. His daughter Tiobhal is described as ‘Princess of the Ocean’ in some late renditions of the myths linking Gullion/Cuillean to the Isle of Man and suggesting a connection with Manannan. At Slieve Gullion, St Brigit’s fosterling and acolyte, St Moninna (a reflex of the name of the Lake Lady of Arthurian legend, Niniane), was said by tradition to have founded the abbey at Kileavy on the slopes of the mountain, during the ‘reign’ of St Patrick. According to legend, she raised a foster-son called Luger, a name reminiscent of that of Lugh. The name ‘Kileavy’ may well be a rendering of the name of the site’s former pagan temple – Kil Aoife, after one of the names of Ireland’s famous ‘Fairy Queens’. Slieve Gullion is famously associated with the legendary folk-character Cailleach Beara, as well as the Lake Lady who turns Fionn into an old man when she bids him dive into the summit lake to find her ring. It was here Cuchullain fought the armies of the Fairy Queen Medb. Curiously, there are few legends of a ‘male’ Gullion or Cuillain the smith, but more linking the named place to the aquatic otherworld female of Atlantic religious myth. Whereas Brigit the Smith can be seen as a forger or re-forger and mystical renewer of life from the death processes of nature, Brigit the Healer fulfils a similar role within the world of the living – renewing from disease and allaying death. The same function is ascribed to the Delphic Greek god Apollo (often known among the ancient Celts as Belenos), brother of the ‘virgin huntress’ goddess Artemis. Artemis was herself not unlike the younger aspect of the Gaelic ‘Cailleach’ – a ‘mistress of animals’ and herds which was appended freely to the qualities of St Brigit of Kildare. Artemis has been likened to a ‘wild’ version of the ‘agricultural’ triad of Demeter-Persephone-Hekate and in some regards can be seen as a female likeness of Dionysus. 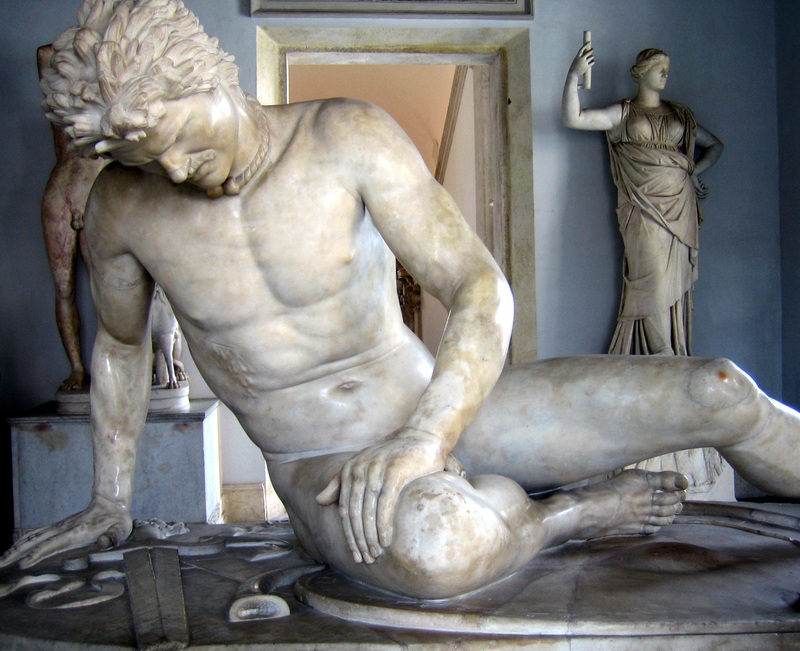 In the Delphic myth, Apollo symbolically conquered death and decay with the mystical act of slaying Python, from whose rotting corpse arose the inspiring fumes of prophecy and the fertility of the dead. 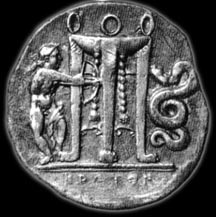 Both he and his son Asclepius (the name implying the ancient onomatopoeic Indo-European word for ‘snake’) were the Greek divinities most often associated with the semantic field of the active healing arts and prophecy. Apollo was also strongly associated with the Muses – Greek goddesses of poetic inspiration, and it can be seen that there is an apparent similitude to the semantic fields of the Brigitine Triad mentioned in Cormac, in the form Brigit, Goddess of Poets. Of course, this represents a closer similarity in many ways to the Delphic religion of Apollo than the Eleusinian religion of Demeter and Persephone, although the Irish system shows evidence of links to both. The Roman equivalent to ancient Artemis was Diana, whose name appears to be a composite of ‘Dea’ and ‘Anna’, meaning ‘Goddess of the Year’. Another Roman goddess possibly linked to her was ‘Anna Perenna’ and the Demeter-like ‘Dea Dia’, worshipped at Rome’s agricultural festival of Ambarvalia, in honour of Ceres. She was considered part of a ‘virgin triad’ of goddesses along with Minerva (Athena) and Vesta (Hestia). The name Diana has, as I have previously discussed, distinct etymological similarities with an Irish goddess: Áine (‘Awnya’) attested in both folklore and medieval written mythology, making her a figure of considerable interest to those studying ancient Irish paganism. The name ‘Áine’ has connotations of the Irish word for ‘circle’: ain. The goddess was associated with the seasons and agriculture, and to the moon and the tides associated with them, and thus somehow to the mystical Gaelic ‘otherworld cycle’ linked to mountains, spring wells, lakes, rivers and the oceans. Apart from her similarity to the Roman Diana (whose cult was centred at Lake Nemi and supervised by the Rex Nemorensis – a priest taken from slave stock, probably Gaulish) she also was also a Gaelic fulfilment of the idea of Demeter/Ceres: The seasonal repetition of the fertility cycle. Just as Persephone was an aspect of Demeter, this makes the likelihood of Brigit relating to Áine in the same way quite high. Another aspect of Áine worth mentioning is her traditional role as a ‘sovereignty goddess’, from whom certain clans claimed ancestry – the Eoghanacht Aine, for instance: Such claims are based upon the link between the nurturing fertile land and the people – held to have been united at a far unspecifiable point in ancient history. Just like the Nile fed Egypt, the Irish (and indeed Celtic) concepts linking goddess and fertility revolved around springs and rivers, whose branching and snaking nature reflected the growth of plants. The etymology of the name of the river Shannon contains words for ‘Ancient’ and the goddess’ name – Seann Aine. The Gaelic ‘goddesses’ of the pagan age were triform – one identity hid a multiplicity of names and aspects. The Gaels (and no doubt the wider body of Atlantic European Celtic peoples) were essentially duotheists, worshipping a male and female entity who can be identified through careful exegesis and critical appraisal of folklore, archaeology, literature and tradition, and from the names of places and land features. 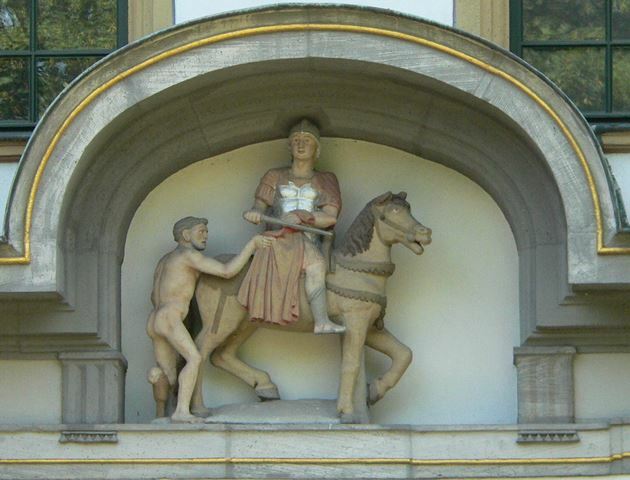 A German statue of St Martin donating his cloak to the poor man. In my previous post I discussed the significance of Armistice Day falling on the 11th of November, which is also St Martin’s day: St Martin of Tours (d.397 CE) was a ‘military’ saint of the early Christian church who evangelised northern Gaul, and who is celebrated as one of the more important ‘local’ saints in northern Europe, along with characters such as St Patrick. St Martin’s day falls on the ‘old’ (Julian calendar) All Saints’ Day (‘Hallowe’en’) and is therefore linked to the celebrations of the Celtish quarter-day festival knownamong the Gaels as Samhain, and which is observed in reverence to the souls of the dead. St Martin’s day (and St Martin’s Eve) customs perhaps unsurprisingly share similarities with those of Hallowe’en: In Germany, for instance, the Gripschen or Heischebrauch customs of children going from door to door begging gifts of food, sweets etc in return for songs (Martinsleid) is associated with St Martin’s day (Martinstag). In Germany – as elsewhere in Europe – this custom was also associated with the medieval ‘souling‘ traditions observed variously on All Hallows day (1st November) or All Hallows Eve (31st October) as well as All Souls’ day (2nd November). In ‘souling’ people would go door to door offering prayers for the dead in return for the gift of ‘soul cakes’. This seems to have evolved into the modern Hallowe’en ‘trick or treat’ custom, but was a feature of other festivals of the ‘winter quarter’, such as the Christmastide ‘wassailing’ and ‘guising’ tradition parties of ancient European tradition. Ritual begging was therefore an ancient and important cultural custom, and the idea of receiving divine favour in return for bestowing hospitality on the poor and needy was a key element to religious observances of the Christian and pre-Christian eras (for example, the Roman and Greek festivals of Saturnalia and Kronia). The most popular legend of St Martin is that of him dividing his soldier’s cloak to share it with a freezing beggar (who was then revealed to him in a vision to have been Christ personified), hence the association of Martin’s festival with begging traditions. In modern Germany and other north European countries, children take part in lantern processions on St Martin’s eve and these are usually led by a man dressed as the saint – often depicted as a Roman soldier with a large cape on horseback. These processions culminate in the St Martin’s bonfires, at which people eat traditional foods and drinks (such as gluwein). Similar festivities in modern Britain occur on 5th November (divested of any Catholic trappings, and often with pyromaniac Protestant iconoclasms). In Ireland bonfire celebrations were formerly held at Samhain. It is evident that they are all based on an older seasonal tradition which has diversified with time and changes to the political and religious landscape. The spirits of the dead were, before and after the advent of christianity, associated with a hunger for the warmth and fecundity of our world. The act of appeasing the needy and hungry can be thought of in technical terms as assuaging this ‘pull’ from the otherworld which might threaten our imminent ‘crossing over’ to join the dead. The legend of Martin of Tours given us by Sulpicius Severus (4th/5thC CE) says that he was originally a Danubian noble serving in a Roman cavalry outfit who, through a process of divine revelation, transitions from a physical form of warfare to the spiritual one of the Christian narrative. This in itself is illustrative of the ‘spiritual rebirth’ through which followers of his religion defined themselves – then and now. This confusion of death and life was typical of the ancient pagan European worldview about warfare and death, a view which was personified by Martin’s namesake – the Roman god Mars who (unlike his Greek counterpart Ares) represented chthonic wealth as well as war. That Martinmas comes at time when it is traditional in Europe to make a celebration of agricultural fertility and full winter stores is therefore intriguing. In the skies, the season is marked by the prominence of the great winter ‘warrior’ (or ‘hunter’) constellation of Orion – imagined as a man holding high a sword and shield. Another interpretation might be a herdsman – cattle were generally moved from pasture into their winter stalls by Martinmas, and the ‘campaigning season’ for warfare was over. The warrior-hunter-herdsman constellation being displayed in the heavens might possibly have been viewed as an indicator that such activities on earth should cease. In Germany another old tradition used to be of herdsmen giving a ritual bundle of branches (the Martinsgerte – ‘Martin’s Switch’) to the farmer at Martinmas, which would be used the next Whitsuntide (Beltain) to drive the cattle to their summer pastures. This may represent the fact that herding was seasonal hired work, and in many places St Martin’s Day was a traditional holiday for herdsmen, who also identified with St George. Whatever the case, wands or switches crop up in many European winter folk-traditions and performances from before the modern age. Martin was said to have been of Illyrian birth – from the ‘Danubian’ provinces of the late Roman empire. Eastern Europe and Germania provided many of the elite cavalry units of the Roman army, and from the late 3rd century military men from these regions came to dominate the upper echelons of the Roman military hierarchy, even providing Emperors. This rise of the ‘Equites’ would in turn syncretise with the military traditions of the western Celtic tribes and eventually give rise to the European ‘knights’ of the middle ages. Martin bestrode both such worlds and his iconography demonstrates this. In the Gallo-Roman world he came to evangelise, as well as the Celticised Danubian provinces of the late Empire the cult of Epona – supposedly a Celtic horse-goddess – was prevalent, especially among military elites. This appears to have had a special Danubian flavour added to it in Eastern Europe, where her cult was linked to that of the ancient Greco-Roman Dioskoroi – the twin brothers who were expert horsemen, and whose legend suggested one was human and the other divine. It is possible that Martin’s father was aware of or even participated in such a cult, as he was said not to have been Christian. Mystery cults – particularly that of Mithras – were prevalent among the late Imperial military. Martin’s figurative rejection of his military calling as one of the Equites (as told by Sulpicius Severus) can be interpreted as a rejection of the figurative cultural importance of the horse among his chosen flock, whose coins before the Roman conquest almost universally depicted the image of the horse along with a multitude of spiritually significant symbols. Severus tells a number of stories of Martin destroying the sacred groves and temples of Gaulish pagans, so the narrative of his hagiography needed to account for this. Tours was a ‘Belgic’ part of Gaul, strongly influenced by the military-spiritual late Iron Age cultural movement which appears to have stimulated the Celtic expansion of the ‘La Téne’ era of the second half of the 1st millennium BCE. Apart from the ritualised begging and celebrations of altruism, there is another old custom associated with St Martin’s day, involving birds. This is represented in Germany by the eating of a goose (the Martinsgans) at a special meal in honour of the saint, although duck is the more favoured bird in modern times. The reason given for this custom is based on the hagiography left by Martin’s contemporary, Sulpicius Severus, who declared the saint’s modesty as one of his virtues, illustrating it by the tale that Martin hid in a goose-shed when the crowds at Tours wished to elevate him to the rank of Bishop. The geese proclaimed his presence and he was forced to accept the honour. Irrespective of the hagiographic legends, it was traditional at this time of the ancient subsistence agriculture cycle of Europe to slaughter geese and pigs (both of which could be salted down to be preserved for the winter). In German ethno-linguistic regions the Schlachtfest (‘Slaughter Festival’) usually coincided with Martinmas. The tradition of animal slaughter at this period might explain the former custom in parts of Ireland of the Martinmas cockerel, which used to be slaughtered on St Martin’s Eve by bleeding. Sometimes a goose was used. The custom survived well into the 20thC – blood from the bird was dripped at the boundaries, corners and portals of the homestead or farmstead in order to procure luck (or protection from the saint) for the coming year. The bird was then eaten at a special meal (meat was only ever an occasional luxury in former times). This bird-slaughtering tradition evolved into the American settlers’ ‘Thanksgiving’ festival, celebrated on the third Thursday of November. All-Hallows or Martinmas were also traditional festivals at which tithes were traditionally paid to churches, and when servants were hired or released from service, sometimes a time when rents were paid. The ‘functional’ aspects of such festivals were sometimes displaced to Michaelmas – and although not practised on Martinmas, the tradition of a goose-feast at Michaelmas (29th September) was observed in Britain. when rents and tithes were often expected. Perhaps variations in the harvest-period between regions have informed this plasticity. In the Isle of Man the custom of slaughtering a fowl was formerly celebrated on St Catherine’s day (25th November – a closer analogue of Thanksgiving) when a female hen suffered its fate, and was committed to a ‘solemn’ burial (perhaps made less solemn by the inebriated state of the celebrants) as part of the festivities of the tiny island nation’s St Catherine’s fairs. The meaning of the Manx ‘St Catherine’s Hen’ and its ritual slaughter and burial at a public fair is obscure – it could be anything from a pagan survival to a modern form of anti-clericalism or anti-Catholicism. What is similar, however, is the better-known bird-killing ritual involving the slaughter of a wren on the same island on the 26th December (St Stephen’s Day), suggesting a pre-Christian avian tradition. In avowedly Catholic Ireland this custom also occurred and in both countries (Mannin and Ireland) there were legends suggesting the wren was the personification of a powerful female fairy, leaving us to conclude that the ritual slaughter of a bird during the winter quarter had some religious significance in the ancient Atlantic world. Returning to St Martin (and the 11th of November), it is worth commenting on some other bird-related associations. Not in the least is the use of the name ‘Martin’ for a class of bird of the family Hirundinidae, including the Swallows, House Martins, Sand Martins etc. These are migratory birds who appear in Europe during the late spring-time, and are usually departed to their over-wintering locations by the 11th of November. Anciently it was believed that, rather than migrating, they in fact slept over winter at the bottom of ponds and rivers. This belief may be based upon the observation of these species regularly skimming down over water in order to drink while ‘on the wing’. By the same estimation, flocks of migratory plovers coming in to roost and feed on estuarine mudflats often appear to be ‘diving’ into the water. In ancient Rhodes (so the 2ndC CE Greek poet Athenaeus tell us) were beggars known as the Chelidonistai (‘Swallow Men’) who would come around in early springtime with the arrival of the swallows and sing traditional songs in order to earn alms. He mentions another class known to him (Coronistai) who carried a dead crow or raven and also solicited alms through a song. Obviously, there is a parallel with the Christianised medieval traditions of ritualised begging, so important to the Christian narrative. These were celebrated in Swabia (Upper Bavaria) at Whitsuntide (the closest Christian festival to Beltain) by the ‘Waterbird Men’, who performed songs for alms. Frazer (‘The Golden Bough’) quotes various German authors saying how these as also going into the forests to gather oak branches and other greenery, as well as sometimes diving into water, or throwing straw effigies of a large bird into water. In medieval times a wooden bird was displayed in Bavarian churches at Whitsun, evidently to depict Jesus, but possibly part of a Christianised tradition of the pagans. Like the Manx and Irish ‘Wren Boys’ these Whitsuntide parties of young men dressed in white, and wore red sashes. Just which ‘water bird’ species (if any) was intended is unclear – it may be that the placing of the bird in water was the origin of the name. Beltain is 6 months from Samhain – at the other side of winter – and St Martin also enjoyed a more ancient midsummer feast (Martinus aestivus, 4th July). The ‘Martin’s Bird’ (Martinsvögel) in Germany might also refer to an old tradition of a bird-shaped harvest sheaf (possibly even the one once cast into the water at Whitsuntide in Swabia), and is also the name sometimes given to other bird species such as the Black or Greater Spotted Woodpecker, the goose or even the Ladybird (also associated in German legend with Frau Holle). The symbolism of migratory birds seems ideals for expressing the cycles of death and rebirth. These are best represented in European legends by species such as the Martins and Swifts, the Geese and Swans, and aquatic species such as the Plovers. St Martin was credited with bringing Christianity (which promised renewal not in this world but another one) to much of the notoriously militant, formerly barbarian Romanised cultures of north Europe. His name and military aspect seem like a fitting identity for someone who converted the Gauls from their vestiges of druidism, which taught that the soul flies from the body after death and is renewed in a far-off place before returning again in a new incarnation. Such empirical and spiritual symbolism pervades the legends and folklore of Celtish and related European cultures, and survives the Christian era – testament to the power of the old and mysterious worldview. Sirona was another mask worn by the Roman-era Celtic (ie – Atlantic) ‘Great Goddess’. We know of her name because of epigraphic evidence found associated with statues of her image, often at 2ndC CE religious sites associated with springs of water. Her name ought properly be written tSirona (as would be the case in modern Irish) as the initial vowel sound of her name is the celtic languages’ dentalised ‘s’, pronounced something like ‘ts-‘ and because of this the name was sometimes written Đirona or Thirona. The most significant areas of her cult stretched from the east of France, and eastward to the waters of the upper Danube in southern Germany, Austria and Hungary. She seems to have been affiliated with hot springs, and was consequently found linked to a solar male god such as Apollo-Borvo or Apollo-Grannus, and both were associated with healing. The name of Sirona is found as far west as Brittany (Amorica) but has not yet been found in Britain – the Britons named their syncretic deity at the great springs in Bath Sulis-Minerva. Because of the ages-old association of mineral-rich hot springs with healing, Sirona’s imagery borrows from the Apollonian family of Greek gods and goddesses, in particular that of Hygeia, daughter of Apollo’s medical son Aesculapias. The syncretic-era statues of Sirona often show her twined with a snake after the manner of her Greek counterpart. Remember, the Celtic peoples of Europe were not late-comers to Greek philosophical, religious and cultural influence: they had at least 600 years of exposure to Greek religion before the era of their conquest and assimilation by the Romans. The Romans also relied upon Greek religious philosophy to underpin their own version of it, and Apollo was perhaps the most influential of Greek gods. 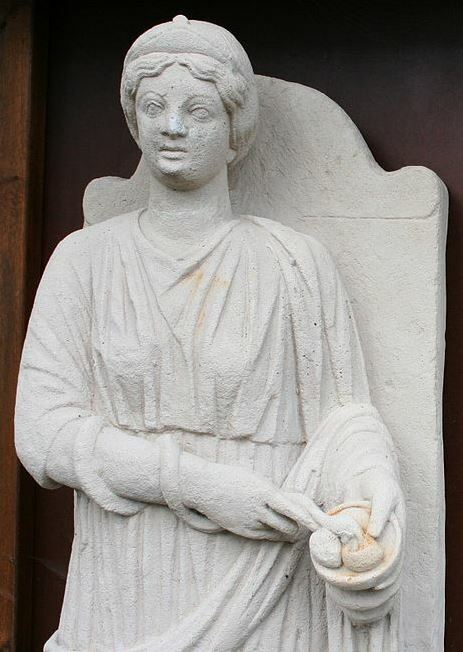 Modern replica of the Sirona statue from the temple discovered at Hochscheid, Moselle, Germany. Note the snake coiled on her arm, eating from a patera of three eggs. The iconography of Sirona tended to depict her as a young woman wearing a long gown (sometimes she was half-naked) with a diadem on her head. A snake was often coiled around her right arm, and she sometimes held a patera containing three eggs in her other hand. The snake in the Hochscheid example appears to be either guarding or interested in eating the eggs, and the combination of these two together is redolent of the ‘Orphic Egg’ of the ancient Thracian/Greek mysteries. Other features of her imagery indicate further references to the chthonic mystery cults, including ears of corn, associated with Demeter and the Eleusinian Mysteries. It has been speculated based upon linguistic evidence that Sirona was a ‘star’ goddess. The ancient Transalpine Gaulish word for ‘star’ was ‘sirom‘, related to the Latin word ‘Sidus‘ (from which we get the word ‘Sidereal’). For the Greeks the word was ‘Aster’. The initial ‘tS’ sound of Sirona was a metathesis to ‘sT-‘. ‘Sirona’ could therefore have derived from ‘Sterona’. To derive the Greek ‘Asteria’ (the name of Hecate’s Titaness mother), the word is preceded by the Celtic ‘definite article’ (‘the’), which was pronounced ‘a’, giving ‘Asteria’ or ‘Asterona’. The diadem on the head of the Hochscheid statue is usually cited as support for this theory of naming. However, modern Gaelic orthography may have preserved some early Celtic language conventions: In particular the ‘tS’ and ‘sT’ metathesis. This makes us, by necessity, examine another word which may relate to the name of Sirona, and has been linked to Bridget – Ireland’s goddess of smithcraft: This is the Gaelic word ‘tSaoir’, which means ‘craftsman’ or ‘smith’, and which is demonstrated in Gaelic family names such as ‘MacTeer’ or ‘Teare’, and the Irish mythological name of the ‘Gobban tSaor’. These, of course, relate to Bridget ‘Goddess of Smithcraft’… So ‘Sirona’ might have nothing to do with stars and more to do with the mysteries of nature’s secret re-forging, as suggested by her snake and eggs and veneration at sacred springs. The temple of Apollo at Delphi is situate on Mount Parnassus, on a rock steep on all sides. A concourse of people, who, collecting from the parts around, through veneration for the majesty of the god, settled on the rock, formed a city there. Thus, not walls, but precipices, not defences formed by the hand, but by nature, protect the temple and the city; so that it is utterly uncertain whether the strength of the place, or the influence of the deity residing in it, attracts more admiration. The central part of the rock falls back in the shape of an amphitheatre; and, in consequence, if ever shouts are raised, or if the noise of trumpets is mingled with them, the sound, from the rocks echoing and re-echoing to one another, is heard many times repeated, and louder than it was made at first. This effect, on those who are ignorant of its cause, and are struck with wonder at it, produces a greater awe of the power of the god. In the winding of the rock, about half way up the hill, there is a small plain, and in it a deep fissure in the ground, which is open for giving oracles; for a cold exhalation, driven upwards by some force, as it were by a wind, produces in the minds of the priestesses a certain madness, and compels them, filled with the influence of the god, to give answers to such as consult them. Hence many rich presents of kings and nations are to be seen there, which, by their magnificence, testify the grateful feelings of those that have paid their vows, and their belief in the oracles given by the deity. Brennus, when he came within sight of the temple, deliberated for some time, whether he should at once make an attempt upon it, or should allow his soldiers, wearied with their march, a night to refresh themselves. The captains of the Emanus and Thessalorus, who had joined him for a share in the booty, advised that “no delay should be made,” while the enemy were unprovided for defence, and the alarm at their coming still fresh; that in the interval of a night, the courage of the enemy would perhaps revive, and assistance come to them; and that the approaches, which were now open, might be blocked up. But the common soldiers, when, after a long endurance of scarcity, they found a country abounding with wine and other provisions, had dispersed themselves over the fields, rejoicing as much at the plenty as if they had gained a victory, and leaving their standards deserted, wandered about to seize on everything like conquerors. This conduct gave some respite to the Delphians. At the first report that the Gauls were approaching, the countrypeople are said to have been prohibited by the oracle from carrying away their corn and wine from their houses. The salutariness of this prohibition was not understood, until, through this abundance of wine and other provisions being thrown in the way of the Gauls, as a stop to their progress, reinforcements from their neighbours had time to collect. The Delphians, accordingly, supported by the strength of their allies, secured their city before the Gauls, who clung to the wine-skins, on which they had seized, could be recalled to their standards. Brennus had sixty-five thousand infantry, selected from his whole army; of the Delphians there were not more than four thousand; in utter contempt of whom, Brennus, to rouse the courage of his men, pointed to the vast quantity of spoil before them, declaring that the statues, and four-horse chariots, of which a great number were visible at a distance, were made of solid gold, and would prove greater prices when they came to be weighed than they were in appearance. 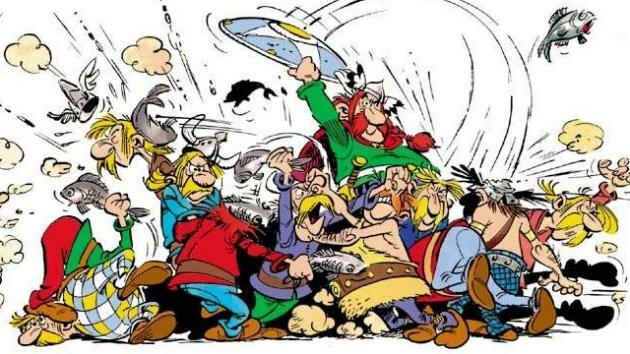 “… At the beginning of the fight the Gauls offered a spirited resistance, especially the company attached to Brennus, which was composed of the tallest and bravest of the Gauls, and that though they were shot at from all sides, and no less distressed by the frost, especially the wounded men. But when Brennus himself was wounded, he was carried fainting from the battle, and the barbarians, harassed on all sides by the Greeks, fell back reluctantly, putting to the sword those who, disabled by wounds or sickness, could not go with them. It is also called dioscyamos, pythonion, adamas, adamenon, hypnoticum, emmanes, atomon, or dithiambrion; Pythagoras and Osthenes call it xeleon, Zoroastres, tephonion, the Romans, inanaoentaria, some, Apollinaris, the Magi, rhaponticum, the Egyptians, saptho, the Thuscans, phoebulonga, the Gauls, bilinuntiam, and the Dacians, dieliam. That Dioscorides gives the Gaulish word as ‘Bilinuntiam’ is often taken as indicative of a concordance between the gods Apollo and the Celtic deity Belenos, and thus it would seem of interest to those who are intrigued by the genesis of the cultural movement of the Celtic ‘tribes’ referred to under the umbrella term Belgae who were somehow linked to the events of 279BC. Dioscorides’ reference to the name ‘pythonian’ for Hyoscyamus also appears to be a reference to this oracular usage, although the myth maintained at Delphi was that priestesses inhaled the exhalations of an ancient vent in the ground, no doubt supposed to conduct the fumes of the decaying corpse of the giant Python killed by Apollo. The fact that Henbane is also known as ‘Stinking Henbane’ due to its unpleasant odour adds to the likelihood that it was responsible for the mind-bending oracles of the Pythia. The reputation for bravery and ferocity of some Celtic warriors was commented on by a number of Roman authors – not in the least to allow themselves to congratulate their own soldiers for defeating them. The same ferocity among ‘barbarian’ warriors next receives comment when Christian Europeans encountered the warring aspect of their pagan neighbours from the north during the ‘Viking’ era, this time in the form of the ‘Berserkr‘ (lit. ‘Bear Skin’) warriors. These were men who had dedicated themselves to Odin, their god of battle. The Anglo-Saxon equivalent was Wodan – a name recognisably connected with the Old/Middle English word ‘Wod(e)’, meaning madness or frenzy. 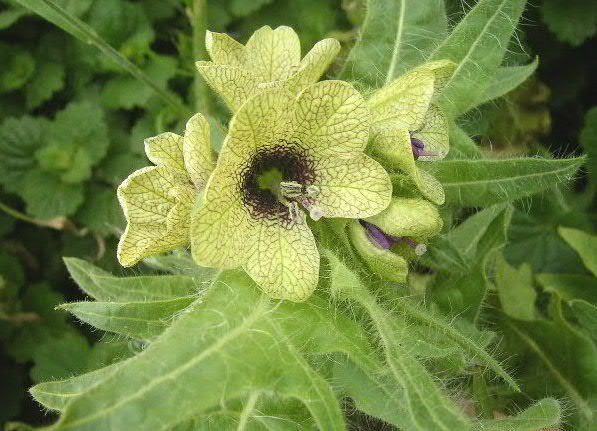 It has been suggested that Henbane is a likely drug that could have been used to induce a visionary or frenzied state in Berserkr warriors, and evidence of Henbane seeds among possessions buried in pagan graves (eg – Fyrkat, Denmark) has been used to reinforce this suggestion (although to my mind they could equally have been used for preventing sea-sickness!). Further to this, there was a tradition in Germany and Bohemia of brewing beer using Henbane, suggesting that ‘Pilsener’ was a name fortuitously apprehended by the burghers of Plzen in Bohemia with which to brand their own pseudo-eponymous mass-produced beer in the 19thC, albeit without the ‘Pilsenkraut’ additives. Bohemia, was of course named after the Celtic Boii tribal federation who were undoubtedly involved in the Balkan, Greek and Anatolian Celtic campaigns of the 4th/3rdC BCE.